Ford O’Neil is the fund manager since October 2008. 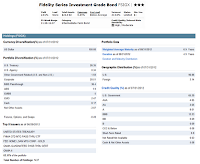 As part of the Fidelity Investments, it has total net assets of $24.05 billion. 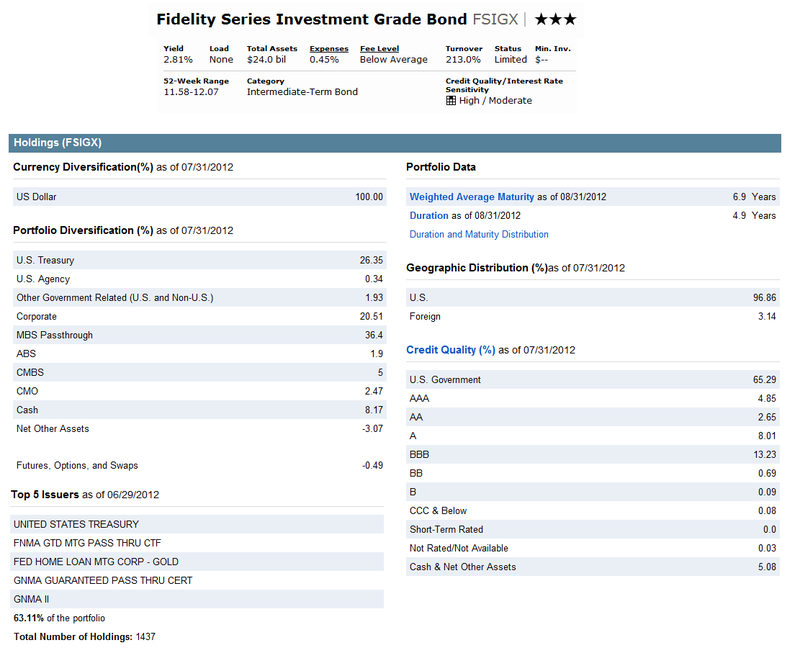 Morningstar rated this Intermediate-Term Bond fund with 3-stars rating. The annual portfolio turnover rate is high, 213% (as of September 17, 2012). It also has annual expense ratio of 0.45%. The fund's shares price is $11.72 (11/12/2012). As of June 2012, the top 5 issuers are United States Treasury, FNMA Gtd Mtg Pass Thru CTF, Fed Home Loan Mortgage Corp – Gold, GNMA Guaranteed Pass Thru Cert and GNMA II. These top issuers represent 63.11% of the total portfolio. This fund has total of 1437 holdings. The top portfolio diversification as of July 2012 is MBS Pass-through (36.4%), US Treasury (26.35%) and Corporate (20.51%). According to the fund prospectus, the principal investment risks are interest rate risk, foreign exposure risk, prepayment risk, issuer-specific changes risk, leverage risk, etc.